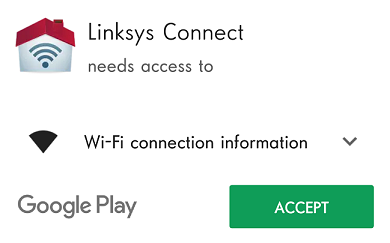 Linksys Connect is an application on your Android™ device that allows you to manage your home network easily. Using this application, you can enable and disable the Guest Access feature, share the Guest password via email or SMS, check and change your router’s wireless settings, view and connect devices via Wi-Fi Protected Setup™ (WPS) or manually access the router's advanced settings. This article assumes that your Android device is wirelessly connected to your Linksys router. NOTE: Make sure you have an active internet connection. On your Home screen, tap . On the search field, enter Linksys Connect. Then tap ACCEPT to start downloading the application. Once the download has been completed, tap OPEN. QUICK TIP: Tap UNINSTALL if you don’t want to proceed with the installation. 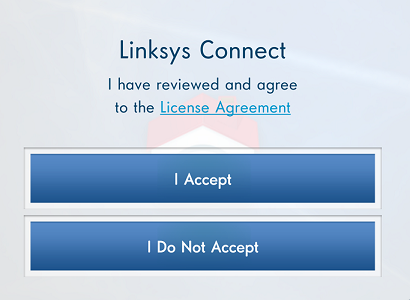 Tap the License Agreement link to read the License Agreement then tap I Accept. You will then see the Linksys Connect icon on your Home screen.